It’s time travel through a mirror, which might, or might not, have a witchy past. I’d like to think it does. Alex and Ruby Pilgrim fall through this bewitched mirror into 1912, right into the middle of a romantic wedding between two Pilgrim ancestors, and a mystery in the shape of a lost valuable antique. It’s a little bit Albert Campion for children, if that’s not being too bold. Between the beginning and the end we meet a ghastly valet by the name of Giles. He is quite dreadful, and not a little sneaky. As Ruby says, he might escape off to Sweden if you take your eyes off him. The illustrations by Brett Helquist are just right, adding to the sense of perfection. OK, I didn’t actually vote with my feet and leave the event with Sally Nicholls and Sheena Wilkinson on Saturday. It felt far too important and interesting, but as with the suffragettes, I had a fight on my hands to be allowed to sit where I needed to sit. Seems we haven’t won yet. A group of suffragettes set the tone, starting the event by singing, which made it easier to imagine what it might have been like, at the time. And having a chair, Manon Bradley, from the Women’s Equality Party, was a nice move. The room was pretty full, but as someone asked, ‘where are the boys? Is our work not done yet?’ I’m guessing it’s down to the parents whether they think to take their sons to a suffragette book event. Or not. They certainly took their daughters. 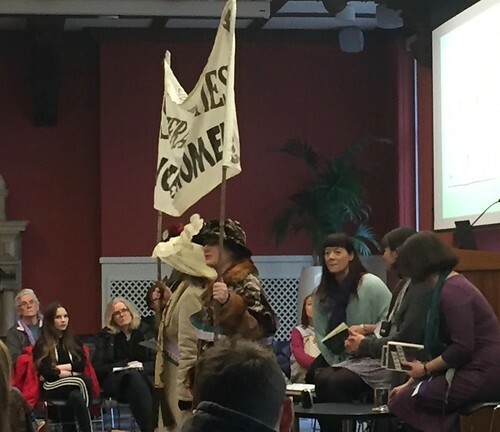 As did I.
Sally started off with a reading from Things a Bright Girl Can Do; the part where they march in Hampstead. Sheena followed with her Star by Star, about Stella who ends up moving to relatives in Ireland when her mother dies from the Spanish flu. The excerpt from a dinner table discussion about women voting, made me really want to read the book. Both Sally and Sheena had been offered the opportunity of writing their books, and both of them managed to resist the idea for maybe ten seconds before caving in. Sally had already written on the subject in her War Girls short story, about the women who could never marry, while Sheena was inspired by a fantastic history teacher at school. Sheena loves research. She read the newspapers for details, one example of which was so gruesome I’ve chosen to forget it already. They both seem to like their heroines angry. Sally particularly enjoyed the language, making Evelyn angry, and Sheena’s Stella fights for what she wants. Sally prefers to write directly, saving the editing until later. She doesn’t write chronologically, so has several scenes on the go. 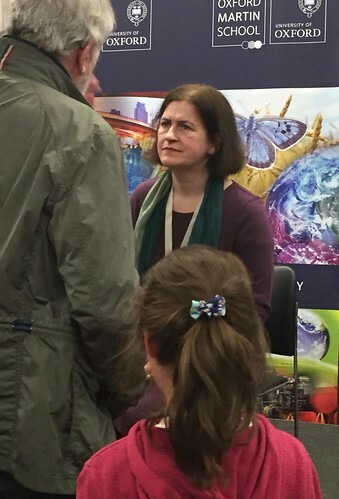 Sheena admires Sylvia Pankhurst, and spoke about an Irish heroine and fine writer [whose name I didn’t catch…]. And I’d say the girls who came, went away feeling empowered. 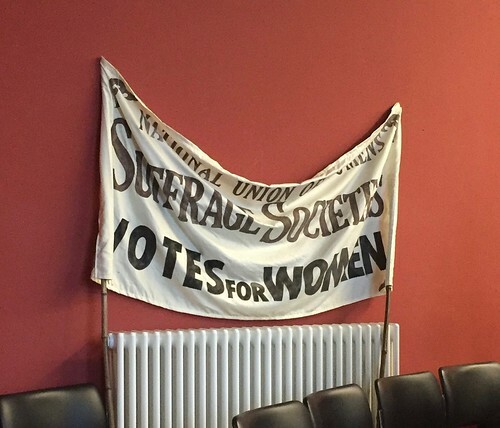 The best for me, though, were the personal memories relating to the suffragette movement, shared by some of the older women in the audience. After a morning of walking round Oxford, waving to colleges everywhere, taking touristy photographs, refraining from buying stuff we don’t need, even when it looks so tempting – Dobby mask, anyone? 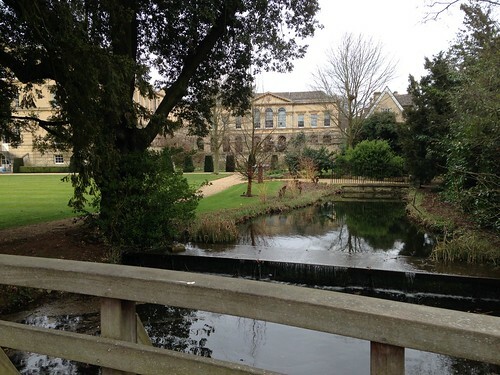 – it was good to get to the litfest venue for a sit down. At our first event with Miriam Halahmy and Bali Rai, I managed a polite negotiation on not sitting where they wanted me. When it came to the event with Sally Nicholls and Sheena Wilkinson, I ended up offering to leave. I somehow don’t feel that 20 of the best – in my opinion – seats should be reserved for latecomers. If there is a next time, I will arrive late. On our way ‘home’ Daughter was enticed into Blackwells where she spent lots of money on some heavy books. I know this, because I carried them, while she carried the pizzas. Safe hands, and all that. Early check-out and changing of the clocks have ensured this brief blog post. There will be more on what people said later. We’ve recently celebrated the centenary of [some] British women winning the right to vote. It wasn’t for everyone, but it was a start. 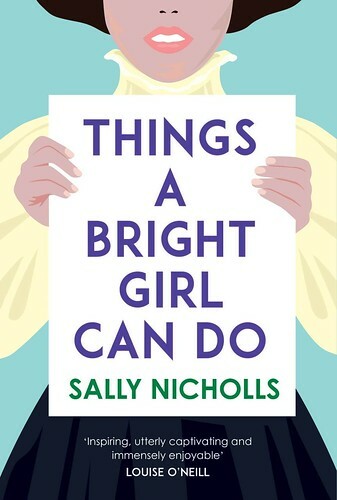 Sally Nicholls has written a suffragette novel – Things a Bright Girl Can Do – and as we meet her three main female characters, well-off Evelyn, educated but threadbare May and working class Nell, many of us know that very soon there will be a war, and this won’t be exclusively about the rights for women to vote. 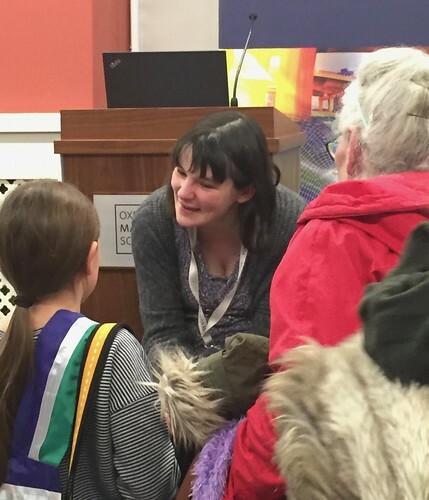 We learn a lot about the suffragette movement – and I was reminded of why I always liked Sylvia Pankhurst the best – as our three girls go about campaigning for votes for women in their own different ways. What I particularly liked was that they have sympathetic people close to them; Evelyn’s young man, Teddy, May’s single mother, and Nell’s [literally] very poor parents. And it’s not just votes for women. May and her mother are Quakers, and both Nell and May like girls best, discovering that they aren’t alone in this. Then there is the lovely Teddy, and the threat of the looming war. After a quick march through protests and fasting in jail, war breaks out, and it’s much tougher than the way it’s usually described in fiction. Yes, young men go off to be slaughtered, but life in England is really hard, especially for people like Nell and her family, who have no money and little food, and someone is always unwell. Trying to remain a true Quaker is not easy, either, at a time when everyone seems to give up their principles for their country. 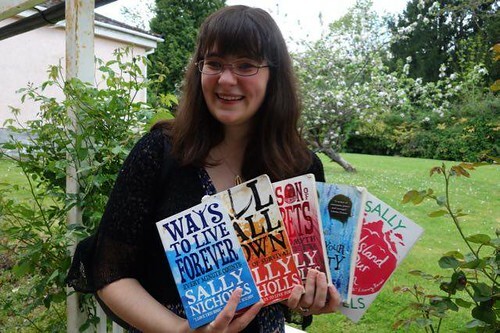 The novel is written in the same light style as Sally’s other books, and it works, despite the difficult topics of suffrage, war, sexual orientation and religious beliefs. In fact, I feel it works better for having this sweetness about it, as the reality of the war years hits home. You come to love these characters, and you discover that death isn’t necessarily the worst thing that could happen. Billy Button is a Little Gem in more ways than one. 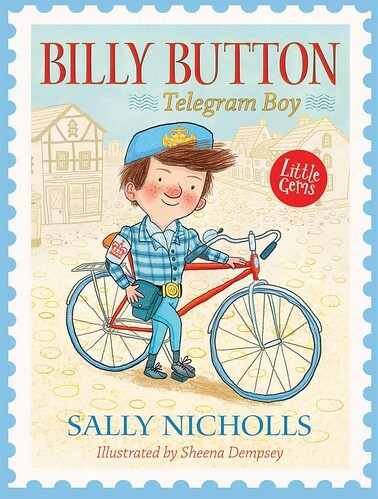 Sally Nicholls has written the loveliest little tale about young Billy who yearns to be a telegram boy. Except he’s too young, and a bit on the small side. But he’s got a big heart and quite a lot of initiative, and when Billy does something, it turns out well in the end. And that’s what we want. Set in the past when we had village shops with post offices as well as telegrams and telegram boys, this is a sweet and slow story about the Button family and angry old Mr Grundle. Luckily – for both Billy and Mr Grundle – the regular telegram boy falls out of a tree, so Billy has to step in and take his place. And where would Mr Grundle be if that hadn’t happened? It’s a bit Miss Marple-ish, minus the murder. 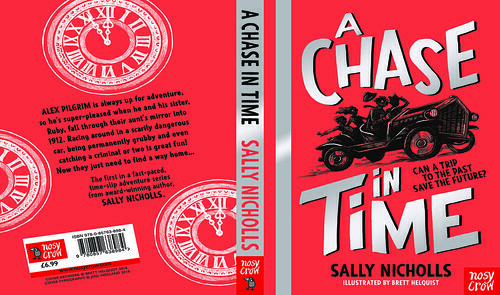 Today is Sally Nicholls’ birthday. I think it’s an excellent date on which to get older, and by now not even Sally is quite as young as she once was. (Happens to us all.) I felt like celebrating, and Sally was kind enough to sacrifice some of her holiday to be my #20. I just hope I haven’t prevented any writing of books, and that Sally still has plenty of time for cake. And other holiday stuff. No full-length ones. I wrote Ways to Live Forever on an MA for Writing for Young People, and as part of that we had to write picture books and early readers and all sorts of things (one of which is actually going to be published next year). But Ways to Live Forever was my first novel-length book. Good question! I’m not sure. I don’t think I’d ever write in praise of something I personally found morally objectionable – although I might write from the point of view of a character who was morally objectionable, I hope I wouldn’t do so in a way that could be used to support their viewpoint. But in this business it’s never a good idea to say never, because sometimes a project will come along and surprise you. I used to say I couldn’t see myself writing from the point of view of a murderer, but … well … you’ve read my back list. I have at least an attempted murderer already. I bumped into Jenny Agutter at Quaglino’s at the Costa Book Awards. That was quite unexpected. Dreadful things happen to most of my characters, I’m afraid. I do have a couple of Edwardian adventurers in a book I’ve got coming out next year, who I suspect live rather thrilling lives – he’s a Collector of Antiquities and she’s a Lady Anthropologist, and they meet in a Peruvian jungle. But – um – then terrible things happen to them both. My child heroes have a better time of it in that book, though. Maybe I’ll pick them. A film has been made of Ways to Live Forever and it was a Very Good Thing. I can play bridge. I used to be able to speak basic Japanese. And I have another which is far too rude to mention. Pippi Longstocking. Or, if I’m not allowed fictional people, her creator, Astrid Lindgren. I have two big sets of shelves in my home – one in my bedroom which covers an entire wall and then both alcoves in the study I share with my husband. The ones in our bedroom are arranged by ‘authors which feel like they belong together’, a scheme invented by my husband. There are loose themes – science fiction, fantasy, poetry, biography etc all go together, then when you’ve read a new book you have to work out if it’s more similar to Conan Doyle or Colin Dexter. This creates something of a problem when authors write very different books, since all books by the same author must be shelved together. Where’s Wally? Reading is supposed to be fun, it’s not something you’re supposed to do against your will. And then while we were finding Wally, I could find out what he’s actually interested in and give him a book about that. I have to say I think Sally’s husband is clever coming up with this tricky shelving system. You could have endless moves caused by an author changing direction very slightly. Now, where is that bodyguard?